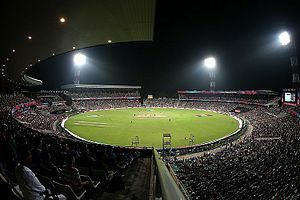 Cricket is a bat-and-ball game played between two teams of eleven players on a field at the centre of which is a 20-metre (22-yard) pitchwith a wicket at each end, each comprising abail balanced on three stumps. The battingside scores runs by striking the ball bowled at the wicket with the bat, while the bowling and fieldig side tries to prevent this and dismiss each player (so they are "out"). Means of dismissal include being bowled, when the ball hits the stumps and dislodges the bails, and by the fielding side catching the ball after it is hit by the bat, but before it hits the ground. When ten players have been dismissed, the innings end and the teams swap roles. The game is adjudicated by two umpires, aided by a third umpire and match referee in international matches. They communicate with two off-field scorers who record the match's statistical information. For most people, taking part in sport will improve your general health and wellbeing. There are plenty of reasons why you should become involved in sport with reduced body fat, bone strengthening, improved stamina and flexibility being some of the reasons why you should take up a sport.